Do you have to have your prints by a certain date? If so, please put in that date below. Please include quantity, size, material (including thickness and finish of edge of acrylic if that is your choice) and paper type (metallic or satin). Please send us your photo. After hitting send you will be directed to a file upload area. We need to check your image to verify aspect ratio and resolution. I Have Multiple and/or Large Images - Send Me To FTP Upload Page. Thank you for your quote request! We'll be in touch shortly! Thanks for your quote request! We'll be in touch shortly. We're now redirecting you to our FTP upload form. Please wait a second while we send your request and image. Larger images may need a little more time to submit. Choose Canvas Options & Add To Cart! Upload your JPG or TIFF (up to 100MB) in RGB. Image over 100MB? Your upload is complete! Just a sec while we configure your image for the ordering process. Large images can take a little bit longer. Please note the Microsoft Edge browser doesn't show the upload progress bar, but your photo is uploading and should appear in the preview window shortly (under 30 seconds for most files). We highly recommend Safari, Chrome or FireFox for best results using our system. Your file is over 100mb so we need you to upload through FTP right here or scale the image to below 100mb. Usually saving as a JPG is the best option, but if you want to use a big TIFF file over 100mb go to our FTP link above and let us know what you'd like to order. 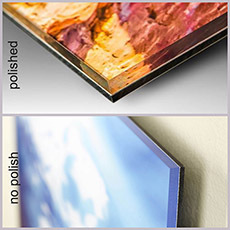 While your photo can be printed up to , our max size for aluminum is 40" on long side and 30" on short side. While your photo can be printed up to , our max size for bamboo is 40" on long side and 30" on short side. Need a custom or larger size block? Stocked Sizes: A bit cheaper per sq inch and gets out a couple days faster. Your photo fits one of our stocked sizes well, but our custom option below allows any size. Custom Size: Any size at or below 40x30 in 1/4" increments. Your image best fits a custom size for minimal to no cropping. Crop complete. If you want to choose another size please hit undo crop button first. Sorry, 3:2 sizes aren't quite ready in the online ordering system, but are coming shortly! Thanks for your patience and please call us at 1-877-518-5187 or submitting a quote to take care of your order. Our canvas prints are produced with outstanding photographic print quality and exceptional durability (no additional protective coating needed). We print on a 21 mil satin canvas that provides a high-quality, acid-free and pH neutral base for consistent printing. This canvas has a bright white satin finish with medium texture. All of our canvas prints come with sawtooth hangers and are ready to hang right out of the box. The depth of your canvas print is 1.5"
x Please upload a photo and choose a size before choosing your options. If you want to see pricing without uploading please use our price calculator here. 1/2" acrylic not available as a proof. Please choose 1/8 or 1/4. TruLife acrylic only available in 1/8" thickness. Anti-Glare acrylic only available in 1/8" thickness. Check box for a clear, diamond polished edge. Default is more opaque, routed edge. Polished edge is required for the 1/2" acrylic. Please be patient while we process your photo. Larger files may take a bit longer.